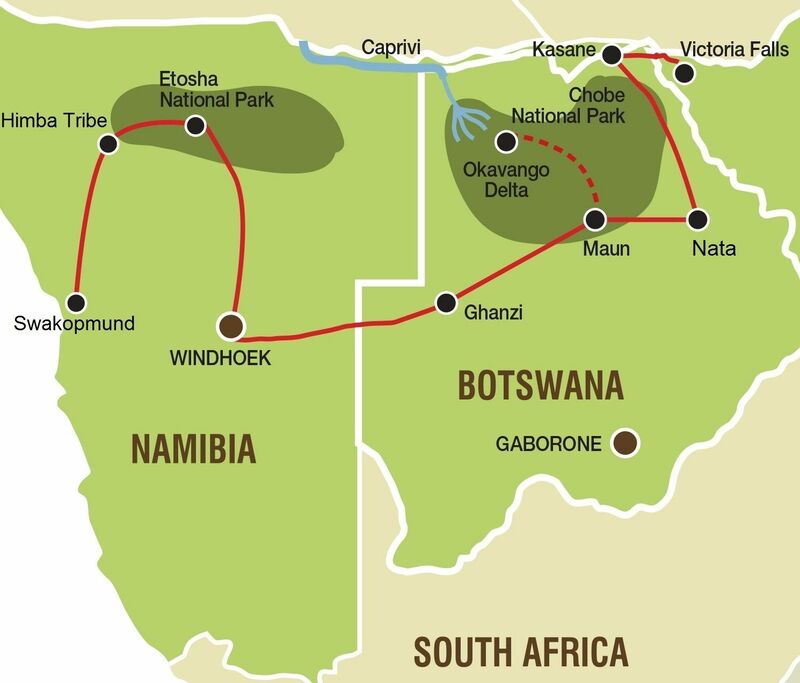 The 12 day Namibia and Botswana Tours form part of the 20 day Cape Town to Victoria Falls tours. If you have some more time on your hands, you should look into doing the whole 20 day tour. This overland group tour departs from Swakopmund in Namibia and ends in Victoria Falls in Zimbabwe. This tour offers a great combination of wildlife safaris, pure nature and diverse cultures. Highlights include: Swakopmund, Spitzkoppe, safaris in Etosha National Park, the Bushmen tribe, the Okavango Delta, Chobe National Park and of course Victoria Falls. We leave Swakopmund early in the morning and make our way to the massive granite formations of Spitzkoppe which tower 700 metres above the desert plains below. The presence of rock art indicates their significance to the San people who lived here many years ago. We will enjoy a walk with a local guide and have the opportunity to view some examples of the rock paintings before setting off for our overnight stop for the evening. The Brandberg (Burning Mountains) are the highest mountains in Namibia and home to the famous "White Lady". The white lady is one of more than 45 000 rock paintings in the area. This morning we will do the 1-hour hike to visit the painting that is said to be around 2 000 years old. After exploring the area, we continue our tour to the area of Kamanjab. Day 3 Etosha National Park - Safari! Rising early this morning we drive to the Etosha National Park. Etosha is the home of some of the most unique safari experiences in Africa. This afternoon we reach the park and begin with our first game drive (looking for wild animals) as we make our way to the rest camp. It is an early rise as we travel to Windhoek, the capital city of Namibia. Upon arrival in Windhoek, we will take a short walk through the city centre and have the opportunity to view some its better known landmarks. Our accommodation for the night is situated halfway between the city and the airport. Before leaving Ghanzi we will enjoy an informative guided walk with the San community. After our walk, we head towards Maun, where upon arrival in Maun this afternoon, you will have the opportunity to go on an optional scenic flight over the Delta (time and weather permitting). This evening our guide will prepare us on what to expect on our full day excursion into the Okavango Delta. * Those guests who have pre-purchased the Okavango Delta upgrade package will be transferred into the Delta upon arrival in Maun and will re-join the group on the morning of day 9. See all the details here. The most rewarding and enjoyable way to explore and experience the beauty and serenity of this intricate system of lily covered channels and lagoons is by dugout canoe (mokoro). Heading out early, we will be transferred by safari vehicle to the poling station (approximately 1 hour transfer) where we will meet the polers who will be escorting us into the Delta. The polers will steer us through the serene area of narrow, reed lined channels which open out onto beautiful lagoons. Reaching one of the many islands, a nature walk may be taken with your poler. After the walk, we return by mokoro through the channels back to the poling station. While the mokoro trail is not primarily a game viewing activity, a variety of game may be spotted in this pristine wilderness area, including elephant, giraffe, kudu, impala and zebra. We rise early this morning as we continue north to our camp on the banks of the Chobe River. This afternoon is set aside for exploring the Chobe National Park. We start exploring in 4x4 vehicles, which allows us an up close and personal experience with the many elephants that frequent the river in the afternoons. The afternoon ends with a leisurely boat cruise and a meal served around the campfire.